Can Atlético Madrid challenge Barcelona this term? "Positivity abounds at Atleti, who finished above Real last season, are increasingly comfortable in their new stadium and tied Antoine Griezmann down with a new contract"
Listos? Muy bien. We go again. Yes, friends, La Liga is back this week, promising its usual cocktail of technical excellence, financial imbalance and administrative clumsiness. It's been a funny (read: dismal) summer for Spanish football, what with the Julen Lopetegui farrago, La Roja's subsequent failure in Russia and the loss of one of the global games's most marketable commodities. But enough about Jefferson Lerma; let's get this season preview on the road, shall we? As dedicated football fan Benjamin Franklin once remarked, there are three certainties in life: death, taxes, and Barcelona and Real Madrid starting a Spanish league campaign as the two favourites. There's no change on that front this year, although Diego Simeone's happy habit of making this a three-horse race is likely to ensure an extra level or two of drama between now and May. Barcelona were runaway winners last time out, their staggering consistency (just one loss and 99 goals scored) making the last few months of the season a formality and papering over the cracks that appeared in the Champions League. Ernesto Valverde will be expecting more of the same domestically and the Blaugrana's summer business has been positive. Dead wood has been sold off (thanks again, Everton!) and some real talent has arrived: Arthur looks the perfect Barça midfielder, Arturo Vidal brings snarl and experience, Clément Lenglet is a handy back-up option at centre-back, and Malcom has huge potential. With Rafinha and Munir El Haddadi hungry for a chance after successful loan spells away, there is real depth in the squad. Andrés Iniesta's departure will be felt, of course and not just in footballing terms. But Philippe Coutinho is growing in stature and Valverde will be hopeful that Ousmane Dembélé, who had such a stop-start 2017/18, will also contribute more. Throw in You Know Who up front and it's little wonder they are as short as [1.8] to retain the title. That price owes plenty to Real Madrid's tricky summer. To say things will be different at the Bernabéu this season would be an understatement: Cristiano Ronaldo, now strutting his stuff in Turin, will be sorely missed, and the same is true of the Zinedine Zidane, he of the steady hand and quizzical smile. The goals, trophies and star power will take some replacing. With no blockbuster signings made so far - Thibaut Courtois, Álvaro Odriozola and Vinícius Júnior are the only arrivals of any note - new boss Lopetegui is likely to have to make do with what he's got. The good thing for him is that what he's got is a squad full of seasoned winners, plus some of the best youngsters in Europe. Given his track record for developing players, we can expect the likes of Odriozola, Marco Asensio, Dani Ceballos, Marcos Llorente and Jesús Vallejo to kick on. Generational shifts take time, however, and in the short term we have to ask where the goals are going to come from in Ronaldo's absence. Karim Benzema and Gareth Bale in particular are going to have to stay fit, and up their output significantly: the former only netted five times in La Liga in 2017/18. Given how far behind Real were last term, we won't be backing them at [3.0]. Which leaves Atlético Madrid, an intriguing proposition at [8.8]. 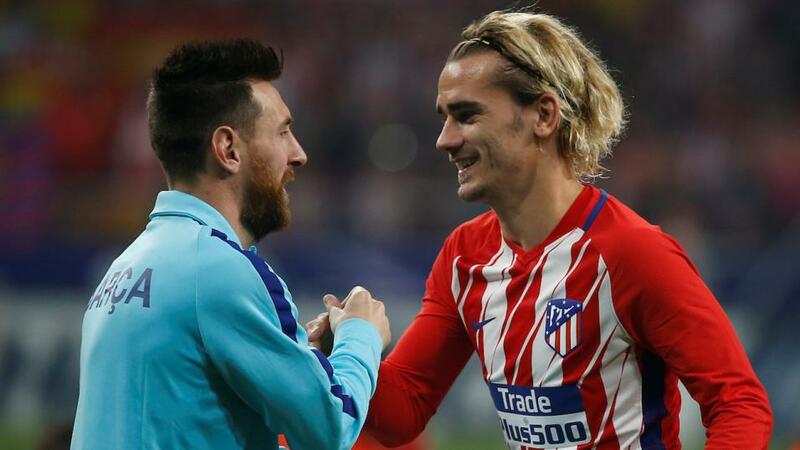 Positivity abounds at the Wanda Metropolitiano, and for good reason: Atleti finished above their city rivals last season, are increasingly comfortable in their new stadium and tied Antoine Griezmann down with a new contract at the start of summer. Diego Simeone also had a golden transfer window, signing classy midfielder Rodri from Villarreal, plus a fresh wing pairing in Thomas Lemar and Gelson Martins. Given that all three are under 24 - like Saúl, Ángel Correa, José María Giménez and Lucas Hernández - the future is certainly bright, but there is also experience in the squad and with El Cholo seemingly refreshed in the dugout, they should provide stiff competition to a Barça side who will have one eye on Europe. It's tough to imagine anyone outside the top three mounting a convincing title challenge, which is reflected in the odds: fourth-favourites Valencia are as long as [170.0], with Villarreal, who finished fifth last term, only rated as [500.0] shots. So it goes. But the race for the final Champions League spot promises to be absorbing in its own right. Valencia are 11/8 shots to finish in the top four after recovering their mojo in such enjoyable fashion last season. Marcelinho remains in the hotseat and has made some astute signings, picking up Daniel Wass from Celta Vigo and signing Michy Batshuayi on loan. There should again be plenty of goals in the side, but Gonçalo Guedes will be a big loss (unless Paris Saint-Germain eventually agree to let him go before deadline) and it remains to be seen how Los Che will cope with the demands of European football alongside La Liga. Sevilla have more recent experience on that front but their preparations for the new season have been disrupted by the revolving door of the transfer window. Lenglet, Steven NZonzi and Joaquín Correa were all key men last term, and while there have been some exciting additions, Pablo Machín - who did so well at Girona last term - may take a while to get to grips with a job of this scale. There could be an opening, then, for either Villarreal or Real Betis. The latter were neutrals' favourites last term thanks to Quique Setién's no-compromise attacking approach, and have made some adventurous signings: Sergio Canales, Takashi Inui and William Carvalho have all come in. Fabián Ruiz will be missed and the Europa League may prove a distraction, but they could be value to finish in the top six again at 9/4. Villarreal look an even better bet at 11/10. The Yellow Submarine have rarely been box-office attractions over the last few years, but have been remarkably consistent (six consecutive top-six finishes) and made a statement by splashing the cash on Espanyol's Gerard Moreno this summer. If he can gel with the lively Pablo Fornals, Javier Calleja's side will be tricky opponents for most sides. Huesca are playing in primera for the first time in their 58-year history, which is an achievement in itself given their resources: their stadium holds just 7500 people and a glance at their squad list explains why they're [1.5] favourites to head straight back to the second flight. Former goalkeeper Leo Franco is just three months into his first managerial job, which doesn't bode well either. Real Valladolid are back after a four-year absence and are also likely to struggle, not least in attack. The departed Jaime Mata scored nearly half of Los Pucelanos' goals in segunda last term (35 of 78) and while Ivi is a decent addition, the shortfall is still going to be huge. [2.25] looks a decent price for them to go back down. The third relegation spot could be more of a crap shoot: Levante, Rayo Vallecano, Leganés and Alavés are all in the conversation. But there's also a chance a team from even higher up last season's league table could be sucked in. Girona might struggle to replicate their performances of 2017/18 and are [5.0] shots to return to segunda, and even Espanyol - [6.0] for the drop - might not be safe after losing Moreno. With Ronaldo out of the picture, Lionel Messi looks like the only option in the top scorer market, even at odds of 8/13. He has never scored fewer than 26 league goals over the last nine seasons - a total never reached by Griezmann and only once by Diego Costa - and with Madrid recalibrating, his stiffest competition may come from team-mate Luis Suárez. The Uruguayan is certainly capable of a big haul and beat Messi to the Pichichi trophy three seasons ago, but has looked laboured at times recently (his early World Cup displays were particularly sluggish) and looks unlikely to steal the limelight from his strike partner again. Premier League: Could glamour over substance tactic cost West Ham?